Charles Ross & Son Company, the world leader in rotor/stator mixing technology, recently announced a new in-line powder induction system. Unlike previous powder wetting systems designed for fast powder induction, the new In-line SLIM (Solids, Liquid Injection Manifold) requires no pump or eductor, which greatly simplifies operation and maintenance, and lowers costs. The unique rotor/stator generator in the In-line SLIM system includes "Progressive Spiral Porting" which produces high flow, high shear, and a high level of vacuum within the rotor/stator generator. This enables the system to operate without a pump and induct powders at unprecedented rates. Benefits include shorter mixing cycles, immediate lump free dispersion of powders, improved end-product quality, and a closed system that eliminates dusting in the plant. The system shown includes a special powder holding vessel and a SLIM powder injection unit driven by a 50 HP motor. 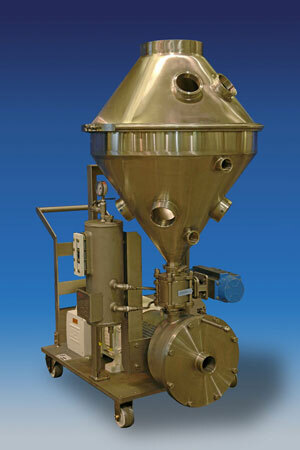 Ross Mixing, Blending, Drying and Dispersion equipment is manufactured in the USA, China and India.